Habasta may not boast the kind of high tech cuisine or the elegant backdrop that garner awards, but the sheer lust for life that Maoz Alonim's kitchen staff puts in every dish makes the place the most hedonistic eatery in town, my favorite, hands down. Every notion I've ever had about friendship bonded by a gourmand feast comes true whenever I eat there, Maoz' Gargantuan presence always booming in the background, the picture postcard image of the genial host. The wines were the usual eclectic lineup. Back when the New World was first trying to emulate the white wines of Burgundy, the winemakers would prop the fruit with a heavy dose of wood, because that's how they interpreted the style. Today, pure, precise fruit flavors are (or should be) the vanguard, the oak refining the structure of the wine during the elevage in barrel without defining the flavors. This vibrant little wine - which we've had before - is an example of this idiom, the flavors on its lithe figure echoing the aromas of apples, peaches, chalk and matchstick. Bourgogne Crown carries the domaine, but not this wine. I was very much captivated by what I'd tasted from Taupenot-Merme, mostly different vintages of Mazoyeres-Chambertin. 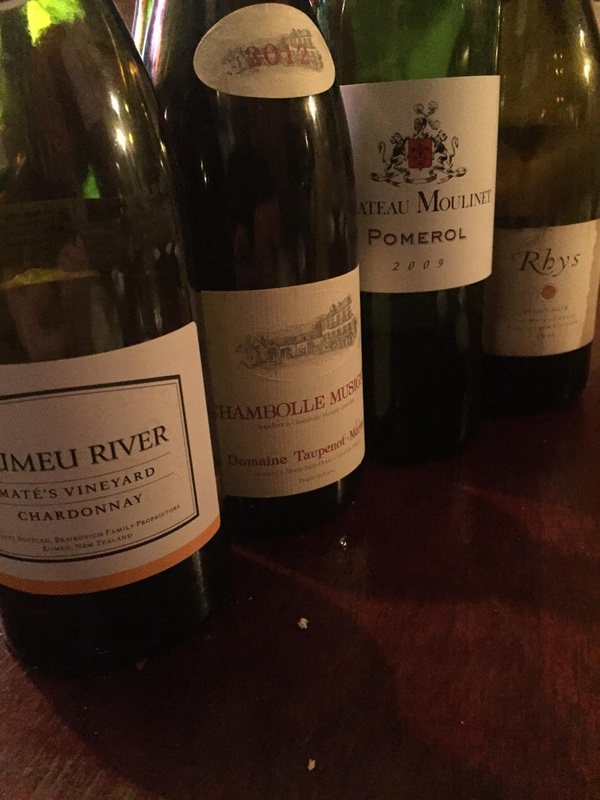 The house style is very floral, mercurial and vibrant; made for Chambolle, I thought when I bought this at London, and the wine was exactly what I expected, easily the star of the evening. Demure initially due to its youth, the vivid freshness stands as a testament to the pedigree and attentive winemaking, its vibrancy and length giving it the punch, if not the complexity and depth, of a Premier Cru. The other Pinots we had were a mess. Rhys is a winery I'd been curious to try for a while, a new hipster cult fave stateside. There is brett here, not a lot, but it does make the result a sort of a cross between Beaujolais and Rhone, the lack of structure denying it the charm of either of the two. If I had a tumor, I'd name it Lucien Le Moine. Despite the aspirations to purity and the "old way" that the domaine's site boasts, winemaker/partner Mounir Saouma just doesn't get Burgundy, the elegant beauty and lightness of being that should be its ideal (unless he interprets old ways as being the tannic soup that used to be sold as, say, Pommard). If Burgundy is ever buried, Mounir will be there to put stones on her grave. He's certainly earned the right, with wines that obscure the loveliness and nuances of Pinot Noir, recalling, as here, a Chateauneuf, with horse saddle, garrigue and sweet fruit. I read this is considered a "value" Pomerol (23 euros in Bordeaux), and this certainly fits the bill, a tasty drop that combines lush fruit with adolescent tannins.